Services Page - Website of typingtornado! Daily Corporate Transcription needs / Teleconferences / Conferences / Editing / Symposiums / Interviews / Transcriptions / Writing / Proofreading / Word Processing / Focus Groups / Public Speakers / Conventions / Board Meetings / An Aide to New Authors / Investor Relations / Conference Calls / Quarterly Earnings Reports / Pharmaceutical Research / University Grant Research Projects / Any Research Project--let's discuss your need! -- Home of Fort Bliss -- that's shorthand for Sun, Salsa and Soldiers! HOOAH! Your One-Woman Wordsmith Shop Since January 1996! 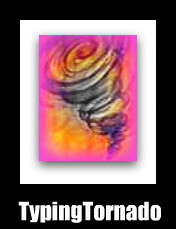 TypingTornado.com -- Your Key To Business Management Success! After all these years, in dedication to my clients and me...a vanity page! Thank you thank you! You continuously redefine amazing. The thing you should know, however, is that we think you are the best – the very best. We’ve had other people do transcription work for us and no one has come anywhere close to how good you are at what you do. Your work is excellent and we are very grateful for you. I appreciate your attention to detail which explain why I wanted to work with you again. Thank you very much for your help. Your timely return of the material and your attention to detail is much appreciated. I am thrilled Bonnie. You do wonderful work. I am really pumped. Tornado? Naww. Hurricane, class 5. Great work. Thank you! I speak for all of us when I say that you are a tremendous help to us. Thanks again. The way it works is that they order a transcription and YOU are always MY first choice! I never have complaints about your work. It’s a bummer when you are booked and I have to use one of our other services. Seriously….holy cow! That was amazing! Thank you so much, Bonnie. Let me spell it out for you: L-I-F-E-S-A-V-E-R! Thank you for being so prompt on this stuff!! You are amazing!! I brag all the time about you! I am a friend of T's – she recommended you because I have some recordings of a hearing that I need to have transcribed and T says that you are the best in the world for this! Bonnie Nadine is extremely professional, organized, quick, and efficient. She does excellent work and saved my hands! Great having you on the team and your high quality work. Thank you! We feel fortunate that we found you. My productivity is definitely up because of your hard work. Bonnie-superior job! Your service is amazing and I am so glad I received your email. Happy Holidays.. Thanks! I will be so grateful if you can turn these around for me in the next couple of days. I know it's tight and I promise to get more organized as I get used to the luxury of having someone else do my transcribing! You're the best, BN. Incidentally, I thought you might like to know that it was your regular email updates reminding me of your services that finally convinced me to do this. I don't remember how we first got acquainted, but I know it was quite a while ago. Anyway, good marketing and follow up on your part. Way to get the gig! Thanks! Another job very well done! Bonnie, you're a pro! I am so appreciative that you were able to turn this around so quickly. THANK YOU! THANK YOU! THANK YOU! And I appreciate your advice below. Did that yesterday with an interview and it sounds much better. Thanks, again. Wow, I just happened to read this one, and it's perfect as usual....Great job! BTW, thanks so much for your speedy turnaround!!!!!!!! You make my job SOOOO much easier and for that I am very grateful. Thanks for all your help!!! You are doing a great job and I don't mean to rush you!!! PHEW! Awesome. You're fast. Thanks so much! Thank you for your prompt work! You really live up to your namesake! I am definitely recommending you to everyone in my company for any future transcription work we need done. Thanks for doing such a wonderful job! Thanks. Looks great. Great job. My new employer is very impressed with your work and turnaround time. I knew they would be. Thanks so much!!!!!!! Bonnie Newman you are AWESOME!!! You did a great job!! I'm so happy we met!